There have been some studies done on pregnant women that have actually demonstrated that your gait motion remains relatively unchanged during pregnancy. However, there is an increased demand on certain muscles of the hip/pelvic region along with the ankle as well. This increase in demand is a contributor to the increased discomfort many pregnant women experience in the low back, hip, and pelvic region. For these reasons, it is even more important to incorporate some form of exercise and conditioning during your pregnancy to help with the stability of your pelvis, and to help with the aches and pains in low back/pelvic region. Many women are familiar with Kegels and Pelvic Rocks. Some additional exercises I personally like for myself are Clams and Wall Squats. Clams are used to strengthen a particular buttock muscle. You begin by lying on your side with a slight bend to both knees. Perform a Kegel to help stabilize you for this exercise, and then raise your top leg by rotating the top part of the knee toward the ceiling. Hold this for 3 seconds, and slowly lower making sure not to rotate the pelvis during the process. Repeat for a total of 10 times each side. You can do a couple reps of these per day depending on your tolerance level. Wall Squats, preferably with a stability ball between your back and the wall, are to help strengthen your thigh musculature. But these muscles originate from the bottom part of the pelvis and are therefore important during pregnancy. Stand with feet parallel and hip-width apart. 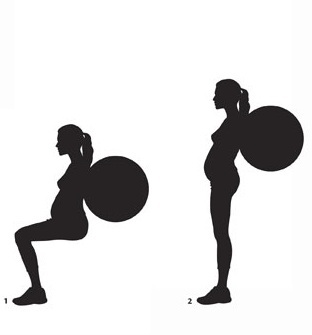 Slowly squat forming a 45-90 degree angle with knees, rolling the ball down the wall. Do not let your knees extend past your ankles. Again, it would be beneficial to hold a Kegel during this exercise for further pelvic stability. Hold this position for 5 seconds, and then return to start. Repeat 10 times. You can do a range 1-3 reps of these depending on your tolerance level.